Rabbit anti Bovine, Canine, Equine, Goat, Human, Mouse, Porcine, Rabbit, Rat, Sheep INSIG2. The immunogen for anti-INSIG2 antibody: synthetic peptide directed towards the N terminal of human INSIG2. Synthetic peptide located within the following region: MAEGETESPGPKKCGPYISSVTSQSVNLMIRGVVLFFIGVFLALVLNLLQ. 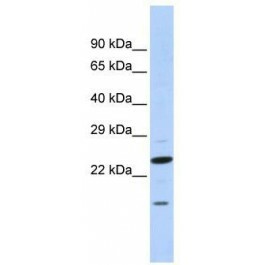 INSIG2 is highly similar to the protein product encoded by gene INSIG1. Both INSIG1 protein and this protein are endoplasmic reticulum proteins that block the processing of sterol regulatory element binding proteins (SREBPs) by binding to SREBP cleavage-activating protein (SCAP), and thus prevent SCAP from escorting SREBPs to the Golgi.The protein encoded by this gene is highly similar to the protein product encoded by gene INSIG1. Both INSIG1 protein and this protein are endoplasmic reticulum proteins that block the processing of sterol regulatory element binding proteins (SREBPs) by binding to SREBP cleavage-activating protein (SCAP), and thus prevent SCAP from escorting SREBPs to the Golgi. Publication Note: This RefSeq record includes a subset of the publications that are available for this gene. Please see the Entrez Gene record to access additiol publications.